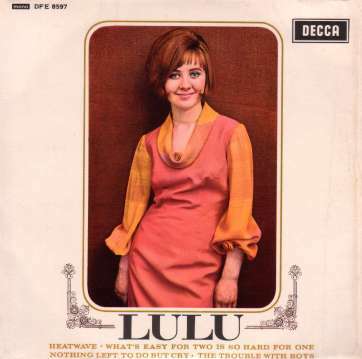 Lulu started her career at 15 years of age singing in Glagow clubs with a group of six male musicians. She was soon spotted by her manager-to-be, Marion Massey, and brought south to record. Renamed 'Lulu And The Luvvers' the group did a remake of the Isley Brothers US hit 'Shout', a record that had failed to have any chart impact in the UK. Aided by an appearance on BBC TV's 'Top Of The Pops' the vivacious 15 year old's first disc rapidly became a top ten hit. Despite the importance of her first single, all her most successful work that followed was downbeat in comparison, mostly ballads. However, although she soon began recording without 'The Luvvers', she lost none of her youthful charm. Besides her records, her personality enabled her to gain other stage work and she proved herself to be a competent actress. Her first big role was in the movie 'To Sir With Love' which starred Sidney Poitier. She also sang the theme which proved highly successful in the USA where it reached #1. However, inexplicably, 'To Sir With Love' was demoted to the 'B' side of 'Let's Pretend' in the UK. Lulu has had a very long career at the top and she still retains a youth that most people envy, so it's easy to think that she's always looked the way she does now. That's why I like this EP so much- because it bears a great photo of the lassie as she was in 1964. An altogether less sophisticated Lulu than the one we've grown familiar with, but still the same effervescent, cheeky personality. Sadly, this is the only EP issued in the UK that I'm aware of, and now quite difficult to find. That's a pity because it carries some songs from her early career which are not easy to find on any format. In 1969, shortly after her marriage to Maurice Gibb, she undertook the UK entry in the Eurovision Song Contest- a fraught activity for any established star. She actually won the contest though tying for first place with no less than three other entries. Unlike many of her contemporaries, Lulu's popularity as a singer and entertainer continued unabated through the 1970s and 1980s though her rate of hits slowed compared with the 1960s. Her marriage to the 'Bee Gee' did not last and she married again during 1976. She re-recorded 'Shout' during 1986 and again reached the top ten with it, doubtless picking up a new set of younger fans. More recently, Lulu has also shown herself to be an accomplished songwriter; her most successful piece being the Tina Turner hit 'I Don't Want To Fight Anymore'. Although the pace of her career has slowed down somewhat since she was fifteen, Lulu still makes occasional TV and musical stage appearances.